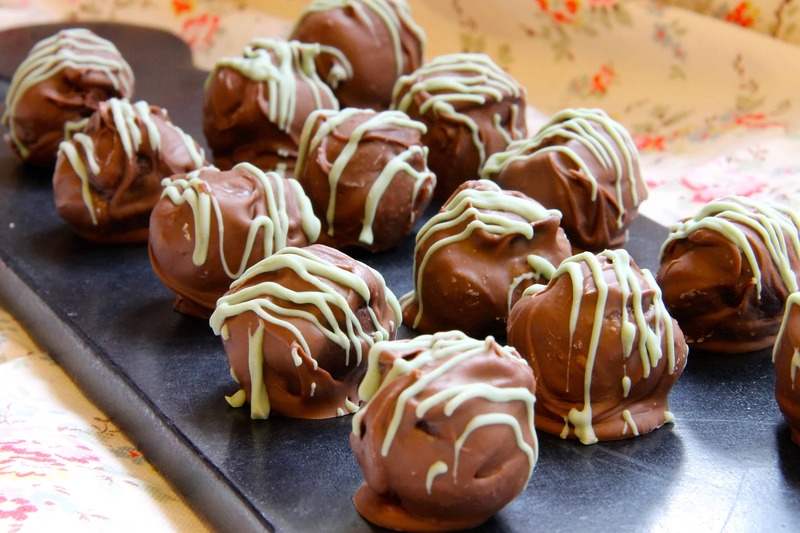 Baileys Truffles – St Patricks Day Recipe! Happy St Patricks Day!! (Well, 2 days early… but at least you can make these in advance now!) You might be able to tell by now that I love sweets, such as truffles and fudge and such – so easy to make at home, and so much cheaper than buying them pre-made! I also had an inkling that as its St Patricks Day coming up – celebrating it in style would be ideal, therefore Baileys Truffles!! They are so indulgent and rich, yet perfectly sized and tasty, so irresistible. This recipe is so easy to do, and you will want to make them over and over, especially if your friends & family start having them – you will all be hooked! I myself are not Irish, but some of my friends are so I always celebrate the day with them yearly – its far too much fun, and I LOVE how much everyone gets in to it! This recipe makes 50 Truffles – Can easily be halved for less! 4) Using a melon baller or two spoons, form into truffle sized rounds and place in the fridge again for a couple of hours so they have a chance to become hard again after being handled – I use a cup of boiling water and dip the melon baller in each time I have rolled a truffle to clean off any excess and it makes it easier for the truffle to come out. 6) Once they are done, melt the white chocolate and mix in the food colouring so it creates a brilliant St Patricks Day Green and drizzle on top of the truffles! 7) Store in the fridge – they will keep in an airtight container for up to 2 weeks! You don’t have to cover the truffles in more chocolate if you don’t want to, you can just do a cocoa powder covering like I have done on my Clotted Cream Chocolate Truffles before – but as I am doing these for St Patricks Day I thought that the Green drizzle would look good! P.s. Enjoy St Patricks day, I know I will – but be safe!! Older Next post: Ferrero Rocher & Nutella Tart! Newer Previous post: Triple Chocolate Cookie Fudge! Hi Jane, how much milk chocolate is required to coat the truffles? No, it’s extra! It’s hard to state how much as people make different sized truffles, but probably another 200-300g of milk/dark to coat, and an extra bit of white for the drizzle! This looks amazing!!! I’m obsessed with Bailey’s! Thank you!! And me to, it’s so delicious!! Can feel my hips groaning just looking at them! Look delish! My hips have already grown from these, I’ve eaten so many!! Haha thank you!!! Happy St Patrick’s Day! I must give these a try – they look delicious! Love the jar idea! That would make such a deliciously adorable gift! Thanks! Its my go-to gift idea for anyone! You’re welcome. :). It’s always nice to have a tired and true treat ready for a special occasion!